Curves which show the bolt travel and bolt velocity with respect to time are very useful in determining what performance can be expected of a design and also provide useful data for the design of the feeder, ejector, firing device, and other auxiliary mechanisms. The formulas derived under the preceding heading may be used to obtain such curves and other data of interest. However, it should be realized that all of these equations were derived under the assumption that the initial bolt energy was transferred to the bolt instantaneously and therefore do not take into full consideration the period of time during which the powder gas pressures act. 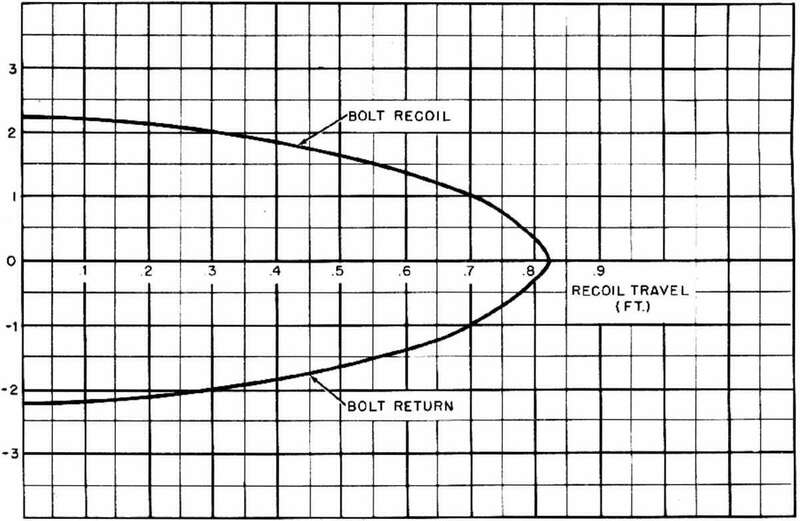 For a gun having a low rate of fire, the events which occur during this period of time are negligible in considering the total bolt travel but when the rate of fire is high, the powder gas pressures exist for a significant portion of the time required for recoil. For this reason, it is usually desirable to take the cffccts of the powder gases into consideration when developing bolt motion curves. Since the effects of the powder gases can not be formulated readily, a special method is employed to plot the curves. The method consists essentially of plotting a curve of free bolt velocity and then subtracting from each ordinate of this curve the loss in velocity resulting from the retarding effect of the spring. bolt. The resulting curves are shown in figs. 1-14 and 1-15.